Brothers and Sisters of one nation and one country of West Papua, who are now moving between and under trees, in the deep and wide forests of Papua, on the coastal areas, down the valleys and on the swampy areas, who are now fighting for our rights openly or in a clandestine manner, even to the diasporas around the globe (Pacific, Europe, America, Australia, Africa and Asia). It has been 50 years since the 1st of May 1963 when the people of West Papua and the Land of West Papua were integrated into the Republic of Indonesia by means of military invasion after the TRIKORA (Tri Komando Rakyat, “People’s Triple Command”) speech by President Soekarno on the 19th of December 1961. Since then the people and the land of West Papua have been experiencing human calamities resulting from a conflict without a peaceful and fair resolution. Hundreds of thousands of the indigenous West Papuans have been murdered, slaughtered and imprisoned by the Republic of Indonesia. Our land of abundance in natural resources has been exploited for the sake of capitalism and development. The capitalism only brings up colonialism. And, that is why the development for the people of West Papua is always under the operation of the militaristic intelligence (services). So, when our people demand a fair compensation due to the use of their traditional land for development, they are always named as the members of Free Papua Organization (OPM) or separatists. Such a condition sets a fire of revolt, Free Papua ideology, which is never put down. Today, our history of the long-lasting Free Papua struggle is added to a long list of the sufferings of the people of West Papua. This should have become a reflection for all of us. Why did Xanana Gusmoa, Ramos Horta and Bishop Belo end the sufferings of the people of Timor Leste within a period of 24 years integration with Indonesia? 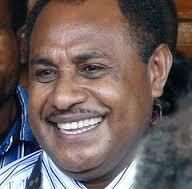 Why has it been 50 years but the Free Papua Organizations has not shown any sign of accomplishment? Is this because our egocentric attitude is weakening us? Or has our loving God not been in our side yet? From our Christian perspective, a 50-year (anniversary) is a jubilant year. It is a year of freedom, a year of recovery for a nation. However, a period of the 1st of May 1963 to the 1st of May 2013 making such a jubilant year has not yet been materialized as being expected to be. Therefore, let us crucify our egoisms, our faction-centered views, our primordial attitudes in order that the pulse of the Papuan nationalism is beating freely to unite a coordinative resolution agenda between civil revolt institutions, guerrilla fighters, and diplomats. Now, the bargaining position of the people of West Papua is the declaration of the Federated Republic of West Papua (NRFPB) in the Third Congress of West Papuan on the 19th of October 2011. May this bargaining position become a juridical foundation for the Melanesian Spearhead Group (MSG) to accept us as one of the members of the group. And then, such recognition of the independence of the NRFPB may also enter into a regional resolution mechanism in the Pacific Islands Forum (PIF) – sixteen countries – which is an integral part of an international resolution instrument to bring our case to the United Nations mechanism. Finally, United We Stand Divided We Fall! Therefore, let us join our hands together to have a coordinative resolution agenda to bring the people of West Papua to enjoy a peaceful, free and full sovereignty.